What is the CERT Program? 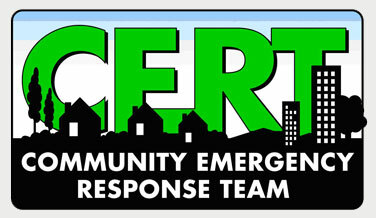 The City of California City Community Emergency Response Training (C.E.R.T.) is designed to help out families, neighborhoods, schools and businesses prepare for effective disaster/emergency response through training and pre planning. This training covers basic skills that are important to know when emergency services are not immediately available. You can make a difference by using the training to save lives and protect property. Emergency responders, emergency management personnel and emergency trained volunteers provide training. Program material covers earthquakes, fires, flood, hazardous incidents and other life-threatening situations. This Federal Emergency Management Agency (FEMA) certified course does not require previous knowledge for participation. First Aid Training is recommended. C.E.R.T. is under the leadership of the California City Fire Department and will include other city departments. Why be a part of the Community Emergency Response Team? Learn decision-making, organizational, and practical Skills to offer immediate assistance to family members, neighbors, and associates. Be able to help others with out placing your self in unnecessary danger. Learn about the resources of your community and how to use them in an emergency. Identify basic hazards and be able to mitigate them. Many C.E.R.T. positions available for any age old or young. In times of major disaster you will be the key community survival. If you would like to see if this would be of interst to you, you can take this self study course "Introduction to Community Emergency Response Teams", IS-317, which is an independent study course that serves as an introduction to CERT for those wanting to complete training or as a refresher for current team members. If you're interested in signing up for, or just getting some information on, our CERT program, please contact Firefighter David Orr at the station or call (760) 373-4841 and leave him a message of interest. If you would like to signup please fill out this form.